Tumors that metastasize to the pituitary gland are unusual, and are typically seen in elderly patients with diffuse malignant disease. The most common metastases to the pituitary are from primary breast and lung cancers. Cai et al., from Shengjing Hospital of China Medical University, Shenyangpresented a 57 year-old patient with pituitary gland metastasis from breast cancer that was treated with extensive radical mastectomy 16 years prior. The pituitary was the sole site of metastasis. The patient was admitted with the chief complaint of blurred vision for 1 year and episodic headaches for 1 month. Magnetic resonance imaging revealed a solid mass in the sellar region with heterogenous contrast enhancement. The preoperative diagnosis was a pituitary adenoma. Neuroendoscopy-assisted tumor resection was conducted through a single-nostril sphenoid sinus approach. A pinkish-white, firm neoplasm was found, with an abundant blood supply and an indistinct boundary between the neoplasm and normal pituitary tissue; complete resection was achieved. The results of immunohistochemical analysis were positive for cytokeratin, Ki-67antigen, estrogen receptors, progesterone receptors, and prolactin induced protein. The neoplasm was negative for SALL4, mammaglobin, and the Glycoprotein hormones, alpha polypeptide. These results were used to reach a final diagnosis of a pituitary gland metastasis from a primary breast carcinoma. The patient’s vision improved significantly after surgery, and no recurrence was detected during one year of follow-up. An 83-year-old woman developed pituitary metastasis while being treated for metastatic breast cancer. She presented with visual disturbance and headache followed by thirst, nocturia and polyuria. A visual field defect was present. MRI revealed a sellar mass consistent with metastasis to the pituitary gland. She was successfully treated with radiotherapy to the sella and had improvement of her visual symptoms and visual field defect. She then required ongoing treatment for diabetes insipidus. Her symptoms had not shown any sign of recurring up to 9 months after treatment. Pituitary metastases are rare but should be suspected in patients with metastatic cancer who present with features similar to those seen here. With improvements in survival in metastatic breast cancer, pituitary metastases may be seen more commonly and active local treatment is warranted given the possibility of resolution of symptoms related to the pituitary metastases 2). Kim et al., reported a 65-year-old woman with pituitary metastasis from breast cancer who presented with recent-onset left progressive deterioration of visual acuity and visual field. 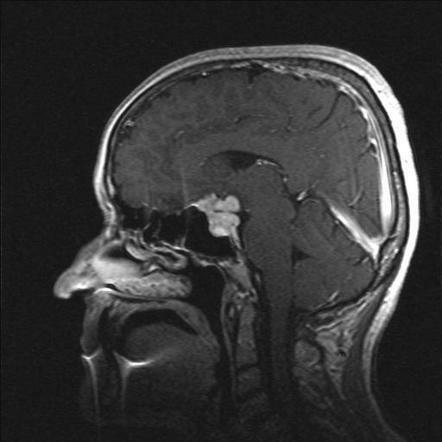 The clinical diagnosis was made after brain and sellar magnetic resonance imaging showed a large sellar mass compressing the optic chiasm and invading the pituitary stalk. An otorhinolaryngology and neurosurgery team removed the tumor via a transsphenoidal approach, and this procedure obtained symptomatic relief. Postoperatively, metastasis from breast invasive ductal adenocarcinoma was confirmed histologically. We report this unusual case with a review of the relevant literature 3). A 55-years-old woman presented with diabetes insipidus resulting from metastasis of the tumor to pituitary infundibulum, which is a rare site for metastasis, without significant complaint resulting from metastasis to other part of the body, or other primary diseases. Further evaluation revealed that in spite of previous reports, which metastasis usually happens in end stage of cancer, the patients had primary breast cancer. In subsequent evaluations of the case, hypofunction of adenohypophysis was also detected 4). Cai H, Liu W, Feng T, Li Z, Liu Y. Clinical Presentation and Pathologic Characteristics of Pituitary Metastasis From Breast Carcinoma: Cases and a Systematic Review of the Literature. World Neurosurg. 2019 Jan 7. pii: S1878-8750(18)32949-8. doi: 10.1016/j.wneu.2018.12.126. [Epub ahead of print] PubMed PMID: 30630045. Gormally JF, Izard MA, Robinson BG, Boyle FM. Pituitary metastasis from breast cancer presenting as diabetes insipidus. BMJ Case Rep. 2014 Apr 12;2014. pii: bcr2014203683. doi: 10.1136/bcr-2014-203683. PubMed PMID: 24729116; PubMed Central PMCID: PMC3987639. Kim YH, Lee BJ, Lee KJ, Cho JH. A case of pituitary metastasis from breast cancer that presented as left visual disturbance. J Korean Neurosurg Soc. 2012 Feb;51(2):94-7. doi: 10.3340/jkns.2012.51.2.94. Epub 2012 Feb 29. PubMed PMID: 22500201; PubMed Central PMCID: PMC3322215. Poursadegh Fard M, Borhani Haghighi A, Bagheri MH. Breast cancer metastasis to pituitary infandibulum. Iran J Med Sci. 2011 Jun;36(2):141-4. PubMed PMID: 23358184; PubMed Central PMCID: PMC3556747.